BETHLEHEM — School may be out for the summer, but students in the BCMS Garden Club are still reaping what they spent the year sowing. At the Delmar Farmer’s Market on July 15, club members brought in record profits selling carrots, green beans, garlic, onions, beets, Swiss chard, kale and cut flowers grown in gardens on the school grounds. 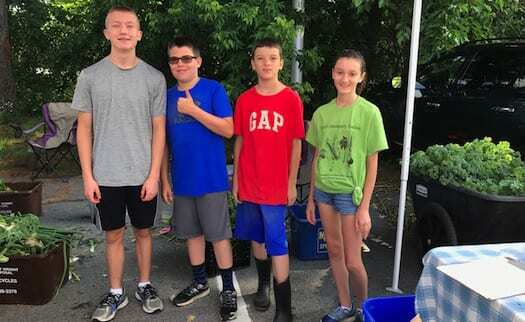 Middle school students Ryan Burns, Aden Hass, Owen Karmel, and Aidan Stickan, along with club advisor Mark Warford, volunteered their time to work at the July market. Satisfied customers and anyone else wishing to support the school’s gardening program can expect the Garden Club to return to the Farmer’s Market in the fall with their latest harvest, although the exact date has yet to be announced. Every school in the district has an organic garden, which supplements food that is prepared and served in their cafeterias. The students not only see the end result of their school’s garden in their own school lunches but also take an active role in planting, tending to and picking produce from it. The district also donates more than 1,000 pounds of produce to the Bethlehem Food Pantry every year.